It’s important to know where you should go to see the best display of fall color. After all, a true foliage connoisseur knows that it’s not just about finding a bunch of trees in full flame. It’s a matter of finding that perfect spot with just the right balance of tone and hue, with a proper framing and at least one interesting feature – a barn, perhaps, or a body of water -- to add a little artistic flair to the scene. Of course, it’s also a good idea to try to match each location to the particular way in which you’re seeing it. Some people love to drive from spot to spot, for instance, while others enjoy any landscape that they haven’t hiked, cycled or paddled their way to. On the other hand, it would be unkind to list places that only the hardiest of leaf-peepers can hope to reach – so I’ve tried to compromise a little bit. Here are a few suggestions for good color opportunities this year, no matter how you choose to get to them. This is what they call a no-brainer, since this very road was just in the running for “Best Scenic Autumn Drive” in the whole country on USA Today’s “10 Best.” Awards, and for all I know it may even have been the winner. 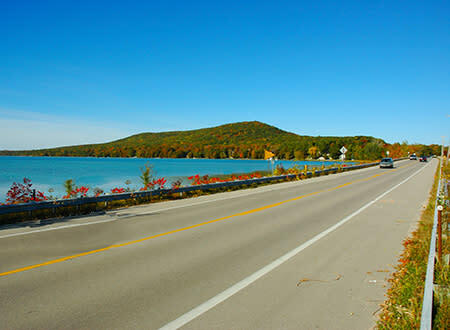 Everybody in this part of the universe knows that M-22 is full of scenic beauty as it winds its way along the shoreline of the Leelanau Peninsula, through wonderful little lakeshore villages, steep hills and sweeping coastal views. It’s easy to do the whole drive up the shore of West Grand Traverse Bay from Traverse City to Northport and down the Lake Michigan side through Leland and Glen Arbor to Empire. My favorite little stretch of the highway is the part many people miss, where it heads south from Glen Arbor and crosses the causeway separating Big Glen and Little Glen lakes. 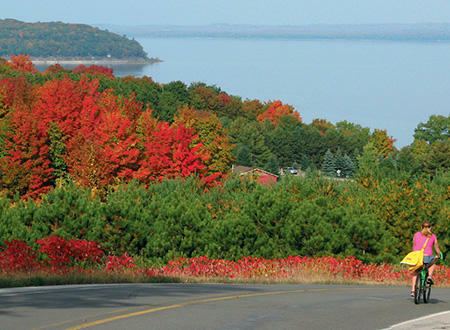 In fall, the great wooded hump of Alligator Hill is ablaze with gold and scarlet, the roadside sumacs are intensely crimson, and the tawny sand of the Sleeping Bear Dune Climb rises up on the far side of the turquoise lake. You don’t have to drive or hike out into the country to enjoy spectacular fall color in the Traverse City area; some of the best color can be found in the city’s beautiful old neighborhoods, thanks to the foresighted people who planted those big avenues of maples and oaks up and down our streets a century ago. 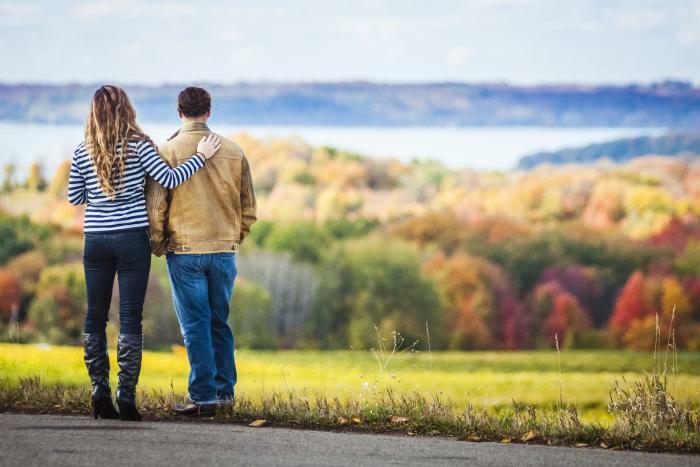 A particularly fine stroll, in fact, is along the network of walking paths that begin on the front lawn of the Village at Grand Traverse Commons and head north to The Pavilions (our medical care facility) on the west side of Traverse City. This “urban forest” was designed in the 1880&apos;s by Dr. James Munson, the first superintendent of the Traverse City Asylum, and many of his original plantings are still standing. In fall, the color of the trees is beautifully set off by the beauty of the Victorian buildings behind them, and by the paths themselves, which curve around the lawns and cross picturesque bridges over a lively little stream. We love our Bay, but some of the earliest and most intense fall color in the Traverse City area is farther inland and higher up, in the Antrim County highlands to the east. There’s probably not a better spot to get a view of all this grandeur than at Shanty Creek Resorts near Bellaire. You could lace up your hiking boots and take a stroll to the top of Schuss Mountain, but you can get an even better view (without working nearly so hard) by parking at Summit Village and walking around the Lakeview Hotel to the top of the ski hill. Here you’ll command a wide view of the mixed-hardwood forests and lakes below, a fascinating layered mosaic of red, orange, gold and deep blue glimmering under the autumn sky. The roller-coaster hills of M-37 on the Old Mission Peninsula are already well-known for their awesome fall color landscapes. The problem is that there aren’t a lot of good spots where a cyclist can stop and gawk without causing trouble for motorists -- who may themselves be dazzled by the scenery. And since it’s a state highway, the traffic can be going pretty fast. 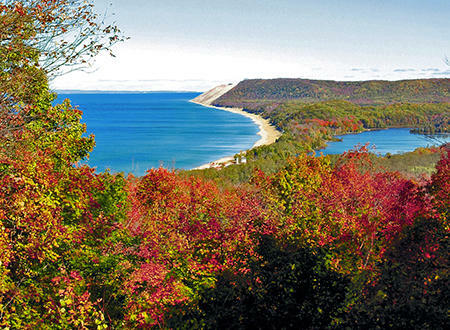 Fortunately, there’s an alternative, which is to follow the Peninsula’s East Bay shoreline north from Traverse City, a relatively gentle route that takes you past lovely neighborhoods, picturesque little coves, and neatly-manicured vineyards climbing the steep forested hills. There’s one major climb, on Smokey Hollow Road -- but it comes with an amazing payoff just past Ladd Road: a panorama of woods and meadows in full autumn glory, set above the Caribbean blue of the Bay. It’s unthinkable to talk about scenery without mentioning the Sleeping Bear Dunes National Lakeshore, our most photogenic attraction. But looking for autumn color in those sweeping Sleeping Bear vistas isn’t always easy. The trick is to find a spot where you can enjoy the gorgeous views of sand and water without missing the intense reds and golds of the hardwood forests that begin on top of the dunes and roll gently eastward. One such place is along the Empire Bluff Trail, a brisk 1.5-mile round trip that starts in the hills south of Empire and takes you through a light-filled forest of colorful trees, eventually leading to an awesome perch hundreds of feet above the glittering surface of Lake Michigan. 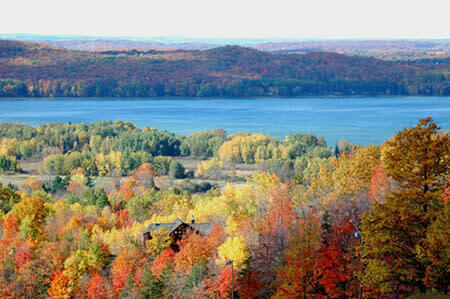 Grand as this view is -- and it’s not to be missed, any season of the year -- the best autumn viewing is a few hundred yards earlier, where there’s a spectacular view to the north that takes in the great Sleeping Bear Dune itself, together with South Bar Lake and a whole range of forest-covered hills just bursting with fall color at the peak of the season. 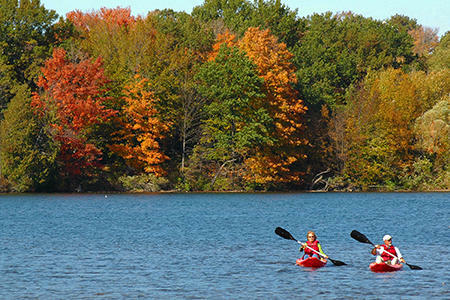 One of the finest ways to enjoy fall color is from the water, especially in a canoe or kayak. These little watercraft make it possible to seek out special spots along our many rivers and inland lakes, and even on the wooded bluffs that tower over parts of Grand Traverse Bay. All paddlers have their favorite fall color destinations, but an easy one can be found near the city, on the south end of Boardman Lake. There’s an easy boat access in tiny Medalie Park, just off busy South Airport Road, and once you’re floating on the water you enter a lovely sanctuary sheltered by high forested banks of maple, ash and oak -- aflame with fall color -- where ducks, geese, swans and other waterfowl cruise among the stumps of drowned trees. You can follow the shoreline north to Hull Park and the public library, or simply cruise slowly among these quiet backwaters, enjoying both the view of the foliage and the local wildlife.